The Lymantria, also known as the Desert Moth, is one of the Creatures in ARK: Survival Evolved. Like its smaller relatives, Lymantria sporarmis survives by draining plants and vegetables of their nutrients. Given the desolate nature of the region, that makes its options rather limited, but fortunately its relationship with the desert's plants is symbiotic. In addition to pollinating them, the spores it releases help nourish the harsh desert plants. 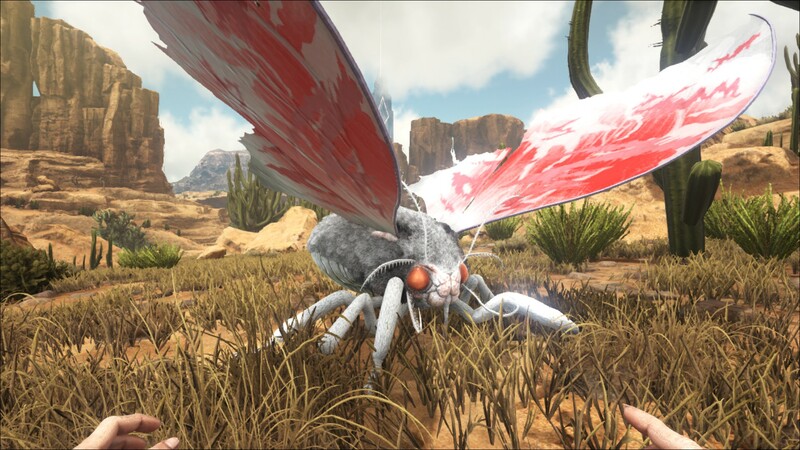 When attacked, the slow-moving Lymantria immediately takes to the air and flies almost straight up while releasing spores. While the spores are nutritious to most plants, they are highly poisonous to most other organisms. Lymantria is occasionally used as a one man flying mount, but its ability to produce silk and spores is often considered more valuable due to its slow flight speed. Its silk can be weaved into heat-dispersing cloth, and its spores gathered for fertilizer or poison. Its saving grace as a mount is its ability to release spores mid flight, allowing it to act as a primitive bomber during sieges. Passive. Upon combat with a player or dino it will deploy a green mist of spores, that slows players and dinos by 90% and drains stamina. While its attacker is distracted, it will flee. It seems to resemble a giant moth, with bright colored wings. This section displays the Lymantria's natural colors and regions. For demonstration, the regions below are colored red over an albino Lymantria. The colored squares shown underneath each region's description are the colors that the Lymantria will randomly spawn with to provide an overall range of its natural color scheme. Hover your cursor over a color to display its name and ID. For example, "cheat SetTargetDinoColor 0 6" would color the Lymantria's "body" magenta. Using the (PC), (PS4), (Xbox One), the Lymantria expels a spore cloud. Upon contact, the spore cloud will deplete stamina and slow player and creature movement speed by 90%. Will fly away when attacked. Ranged weapons are recommended in order to avoid the spores. 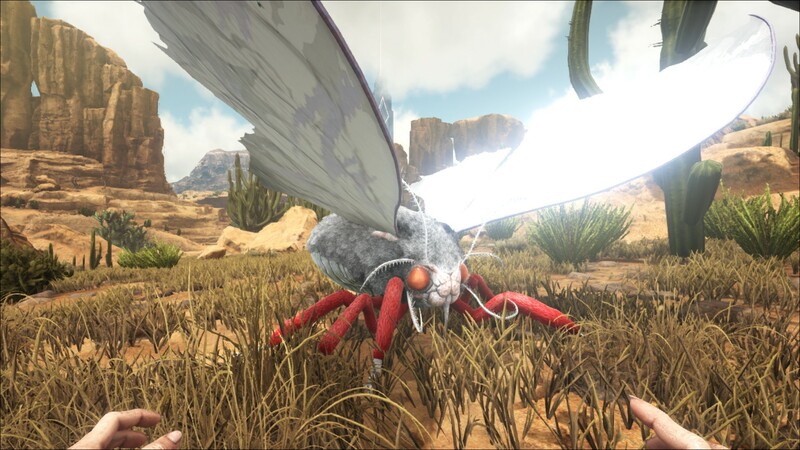 When you hit the Lymantria, it deploys a cloud of spores which will deplete stamina as well as slowing dinos and players by 90%. watch out for wild dinosaurs while fighting, if you get hit by the spores any medium sized carnivore will make short work of you. Use a bola to stop it from flying away. Use a bola so it can't fly away, then knock it out. While it doesn't have very high torpor, it also has rather low health, so using a boomerang is discouraged unless it's a higher level. Shoot its wing and abdomen with a standard bow and tranq shots and be quick or it will either die or fly away. Beginner Flying Mount: It can't fly very fast and its attack is rather weak, so It is mostly used for beginning players who just want a flying mount to get past particularly difficult terrain. Taming Mount: Unlike other flyers, the Lymantria cannot pick up creatures. However, its slowing ability does not aggro neutral creatures such as Morellatops or Paraceratherium. This allows the rider to slow down a target while leaving other tribe members to tame the slow-moving creature. Silk Producer: On ARK Digest number 40, the Moth was confirmed to produce silk in a future update. making it incredibly useful not only on Scorched Earth, but on maps without any way to make silk for possible tools and armor repairs. 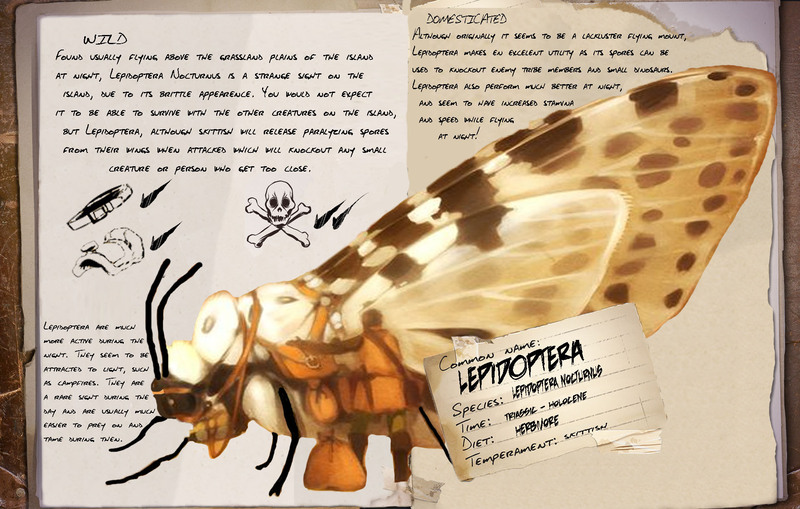 On February 15, 2016, a fan-made dossier of a giant lepidoptera was uploaded onto the fan art section of the Ark forums. The spores do not affect other Lymantria. It is the only rideable flying herbivore in the game. ↑ Community Crunch 62, ARK Digest 40 & NVIDIA Ansel Photography Results!